Well, the name says it all really — Batur Mountain View Hotel is a small, smart, modern, mid-range spot with a great view of the mountain. Hidden in a side street, you’ll only see the reception area and restaurant from the road as a staircase leads to the cliffside rooms below. Deluxe, Superior and Suite rooms (all are non-smoking) have views, but the Standard room only from the verandah. Rooms are spacious, bright and airy, creme painted with shiny tiles and all are spotless. Modern-styled solid wooden furniture feature in most rooms, with bedside tables and lamps, a small bench and rattan lounge. Standard rooms are more spartan, and beds are padded vinyl rather than wood. Bed linen is in bold modern colours and gives a bit of focus to the pale-coloured rooms. Verandas are furnished with rattan or wooden tables and chairs. Hot-water bathrooms continue the modern theme with the larger rooms having tubs and the showers have glass shower screens. Stone sinks and bamboo towel racks lend an Asian touch. The attached restaurant has a both and indoor section and an open unshaded balcony and serves local fare at reasonable prices. We tried the ikan bakar — fresh barbecued lake fish (45,000 rupiah) — spicy as we had requested and very tasty. Breakfast is included. The free WiFi doesn’t reach the rooms, but works fine in the restaurant. You’ll find Batur Mountain View 500 metres along a small road that leads down the mountain off Jalan Raya Kintamani next to Pura Batur Selatan, a small local temple. The road beside the hotel can be very busy with trucks, so rooms can be noisy. From the hotel it’s a fifteen minute drive down to the lake, and the start of the Gunung Batur climb. 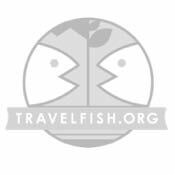 The welcoming and helpful staff can arrange trekking tours and transport. If full, The Cave on Jalan Raya Penelokan has similar styled rooms and views. 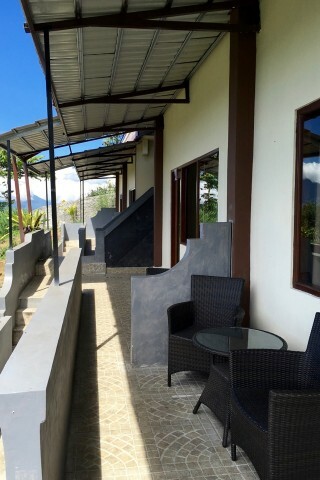 Check rates at Batur Mountain View Hotel on Booking.com.